In the weeks to come, in addition to our news, articles, and free modules, I will be also write news and articles relevant to entrepreneurs, managers, and business owners with practical tips, guides, and work processes. I'm also keeping my fingers crossed and hoping I will be able to upload webinars shortly and also finish up and present to you our HR and HCD website for Insiteful Solutions and Consult. So what's YOUR focus for the rest of the month? Remember it's not to late to set goals and achieve your goals as well as catch up with any work you have been procastinating on so that we look forward to June with joy and eagerness about the things to come not dread at the work we will still be dragging behind us like unwanted baggage. Have a great week everyone and enjoy the rest of the month!! Abuja — MILITARY Pension Board, MPB, weekend, said that some people attacking the government over their non-capture by the board in its pension service were in no time served in the military, debunking rumours that the board refused to pay them their entitlements.The Chairman of the Board, Real Admiral Muhammed Mshelia who stated this in a press conference in Abuja however noted that 'some few among them actually served in the military, but never qualified for pension, because they did not serve up to the pensionable years upon retirement. Reacting to a media report featuring one Mr. Smile Markson who paraded himself as ex-soldier, the chairman explained that Markson had never been a soldier, and that, their record shows that he is using regimental number belonging to another ex-officer. According to a memo dated 9th of May, 2012 with reference number REC/G1/300/79 from Army Headquarter, "there are also no records to show that he (Smile Markson) ever served as a solder and discharged as claimed. Meanwhile, the regimental number 63NA/66930 which he claimed to be his does not belong to him but belong to ex-CPL Nimzing Iliya". The new payroll software, Integrated Personnel & Payroll Information System (IPPIS), implemented by the federal government has helped uncover N14 billion excess funds for salary allocated to the various ministries, departments and agencies (MDAs) in the country. The system has also discovered no fewer than 35,000 ghost workers in the nation's civil service. Coordinating minister for the economy/minister of finance Dr. Ngozi Okonjo-Iweala and the minister of state for finance, Dr. Yerima Lawal Ngama made these revelations during an oversight visit by the House of Representatives Committee on Finance to the ministry in Abuja yesterday. Ngama said that MDAs have been submitting payroll voucher far in excess of the actual salary they pay, such that after payments have been made so much money would still be floating in the accounts of the MDAs. "We introduced the IPPIS computer software for capturing all the data of staff of MDAs. We have today covered 183 MDAs and discovered 35,000 ghost workers. We have saved government N14 billion. By the time we finish, all other government agencies, including the military, police, among others, the savings will be much more," he said.Speaking on the state of the economy, Okonjo-Iweala stressed that the country was not experiencing a financial crisis....According to her, the government was planning to borrow $7.9 billion from multilateral agencies on a medium term to 2014 at interest rate of 3 per cent and below. This, she said, would be used for very productive investment in agriculture, water resources, power, transport, education and health as well as to support the strengthening of governance. The Chairman, House Committee on Finance, Dr. Abdulmumuni Jibril, expressed concern over the high budget deficit and tasked the ministry on ways to improve revenue and remittances accruing to the federal government. hmmm...darling readers, what do you make of all this? IS THERE STILL A PLACE FOR ETIQUETTE IN THE OFFICE? YES! Over the course of our careers, we will learn new skills and spend money on training and professional development to remain relevant and employable. However, there are work skills that if you don’t have, can affect your employment negatively. One of them is your ability to conduct yourself in accordance to acceptable codes of conduct and behavior in the office collectively known as work etiquette. 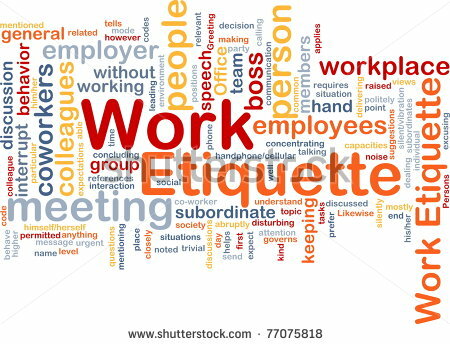 Work etiquette encompasses far more than simply knowing which hands to hold your knife and fork at the office formal dinner party. It's more than a polite smile and a thank you when your colleague hands you something that you asked for. It incorporates all types of manners and behaviors including those that involve your work dealings which influence how you come across as an individual, how you relate to others both within your own organization and externally and how you make use of the tools with which you can communicate. 1. ZIP IT Learn to think before you speak. Bite your tongue before that provocative remark comes out of your mouth and you find yourself embroiled in a fight. 2. SIT, WAIT, THINK AND ACT WHEN CORRECT. Whenever you have issues in the workplace, you're better off thinking through your words before you voice complaints, thoughts or suggestions. 3. LISTEN, DON'T DISPUTE. Sometimes your manager needs to tell you how disappointed he is with you. Sometimes your co-worker needs to go on a rant about how you "neglect" him or her. Sometimes your employee needs to express his or her resentment about the way you've treated them. You can't argue with feelings. But remember, listening doesnt mean absorbing and when it becomes personal, walk away. 4. DOCUMENT, DOCUMENT AND DOCUMENT AGAIN. Rule No. 3 having been followed, make sure you protect yourself with thorough documentation of any potentially volatile situation. This rule applies to people on both sides of the power structure. A smart employee as well as a smart manager will document issues that relate to self-preservation and the protection of their job/company. 5. CLEAR BOUNDARIES MAKE FOR GOOD WORK RELATIONSHIPS Create boundaries and set limits in the workplace. Know how much contact you can take and how much will ignite your internal nuclear bomb. Also, keep in mind that you don't know which one of your co-workers will be easily ignited, offended or wounded so it’s better to be proactive rather than reactive until you identify your more temperamental work mates. 6. CORDIALITY AND FRIENDLINESS After creating appropriate boundaries, make every effort to be cordial and friendly. Ask co-workers and supervisors about how they are; notice changes in their appearance in a complimentary way; comment upon the quality of their (good) work. 7. THOU SHALT NOT OVERREACT. EVER. When people feel neglected, they often will create a scenario that invites your overreaction. Overreactions cause all out wars and can get you into serious trouble so don't do it! Assess all disputes. Are they really worth fighting over?" the answer more often than not will be no. 9. STAY IN THE DRIVER'S SEAT. Take control of potentially volatile work situations and take charge of managing them strategize and evaluate the personalities you contend with and apply good people management techniques relevant to the people you live with during your workday. 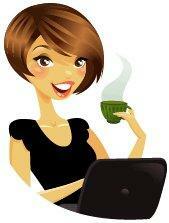 Observing work etiquette is important because you are your own biggest ambassador/spokesperson at work. Always act with honesty and dignity. Be neat, clean and as conservative as the business requires you to be. Keep your interruptions of others to a minimum and always apologize if your intrusion is an interruption of a discussion, someone’s concentration or other activity. Show respect for other peoples’ workspace(s). Show appreciation for the courtesies extended to you. make “Please; Thank you; You’re welcome”, part of your everyday vocabulary. Be discreet and compassionate in your criticism of a co-worker and never blame someone else for your own mistake(s) but do politely and firmly stand up for yourself whenever necessary.